Memo to Yankees: Get Rid of Cashman! Those of you who have followed my dissatisfaction with this year's player acquisitions and deacquisitions by the New York Yankees, and those of you who have suffered through some pretty insufferable games at the stadium in the Bronx these past few months, might appreciate YANKS TRADE STAR PLAYERS, KEEP DUD G.M., by Murray Chass, a former New York Times sportswriter. On this I think he is spot-on. If the Yankees have any hope of getting my complete devotion back, they really must get rid of Brian Cashman. Dud G.M., indeed! Yankee Stadium, June 11, 2016. I keep hearing how the Yankees traded Andrew Miller for prospects that will build the team in the future. As I've noted before, there are still about two months more of baseball left this year (for the Yankees, that is), and I haven't been enjoying the games recently. I have posted my remaining tickets for sale. So far, no bites (I'm not taking a loss, so won't discount below what I paid for them). So I do resent the abandonment of the current licensees for some unknowable "future" team. And if Cashman behaves as he has in the past, he will trade many of these great "prospects" in the off-season for more has-been players. My prediction, agree or not as you believe. My sales rep says that I will be letting him down if I don't renew my season tickets. Ah, well, never knew it was my duty to keep my rep happy, but if so, so long, farewell, and goodbye. I imagine I will be buying single tickets here and there next year, at a discount whenever possible. By the way, I actually enjoyed the Mets-Yankees game last night. I figured I'd mention that, since I've been whining so much recently. 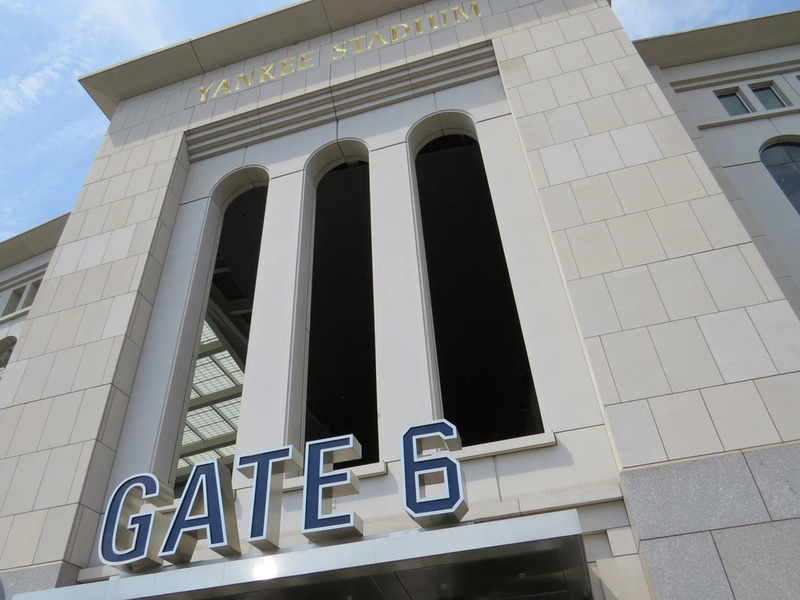 I don't expect I'll enjoy that many more games, but since I haven't been able to sell my tickets so far, I imagine I'll be hanging out in the Bronx more days than not. I'll be there tonight, for the last Mets-Yankees game of the season. I intend to cheer for Andrew Miller if he comes in to pitch for Cleveland this weekend. 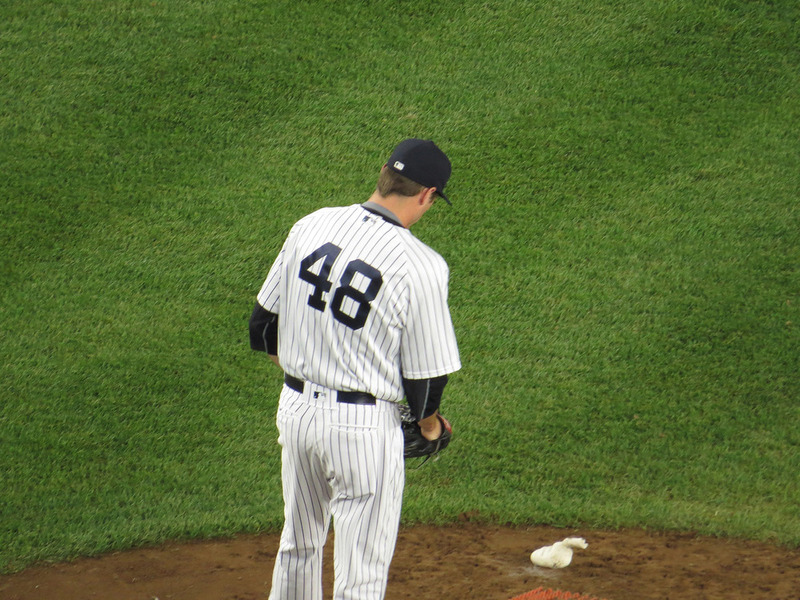 The two photos below are from the game on July 22, when he pitched against San Francisco as a Yankee (I saw him in the stadium the last time as a Yankee on July 23, but didn't take photos). A rainbow over Yankee Stadium on June 11. I have enjoyed several double rainbows at Yankee Stadium over the years. Unfortunately, they don't occur all that often, and rarely predict that the Yankees have a pot of gold at the end of the rainbows. And I do understand that in order to see the rainbows, you often have to survive the storms. I hope the current storm passes quickly. I'd like more rainbows.